Spring did officially arrive last week…. didn’t it? Where’s the sunshine and the warm breezes? I made a trip to the Nashville Flea Market yesterday and just about froze! I came home with a few fun items but no great furniture piece. I’ll share the trip with you tomorrow. The $5 cabinet from My Favorite Junk Shop is spruced up and ready to hold laptops, modems, routers, blah-blah-blah. 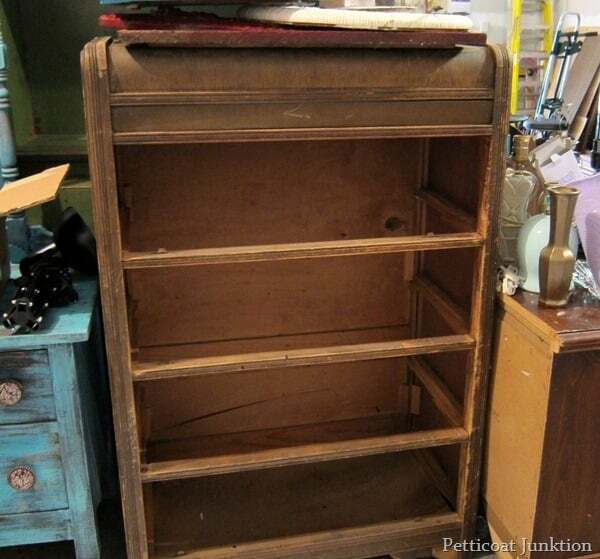 This is how the cabinet looked when I brought it home…a gutted, drawerless, vintage chest. The veneer was peeling and I removed most of the veneer from the top and one side. 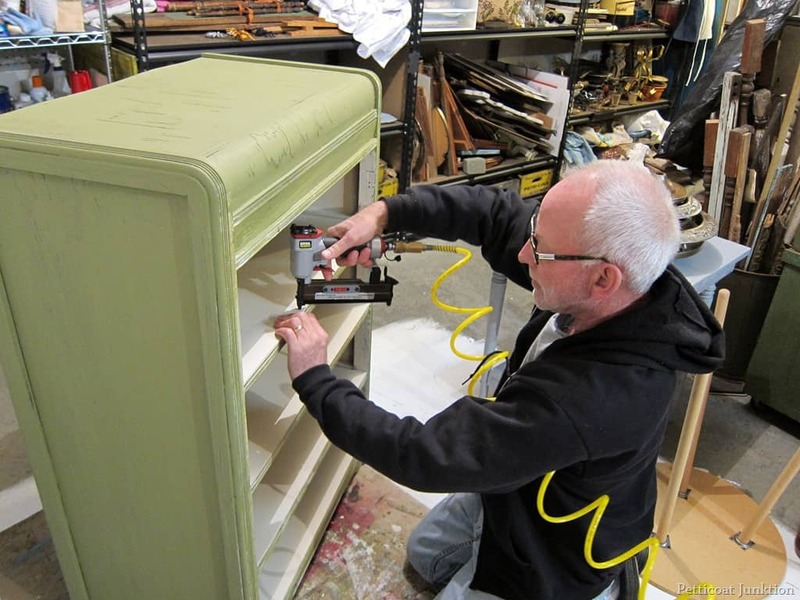 The JTS cut some shelves for me…..I painted them….he attached them to the cabinet with a nail gun. Don’t know what I would do without the JTS. I wasn’t around when he was cutting the shelves so no pics of that. I used Miss Mustard Seed’s Milk Paint in Boxwood for the outer casing. I lightened the dark green shade of the Boxwood with MMSMP in Ironstone. Since the cabinet was a mixture of stained veneer and raw wood (where the veneer was removed), I knew the paint would not chip evenly so I added the MMS Bonding Agent. The inside and the shelves are painted with Off-White Reclaim. The plan is to pair this piece with the White Desk and Chair I painted last week. I’m hoping to organize all of our computer stuff. It will probably still be a mess. Cords everywhere!!! I’ll give you a peek at the set-up once I get everything organized. Is the cabinet too shabby for you? If it is….that’s ok….I understand completely…..
Can I ask If you dry brushed some white around the frame over the green?. I love that look was just wondering how you achieved it? I’m sorry Barb. 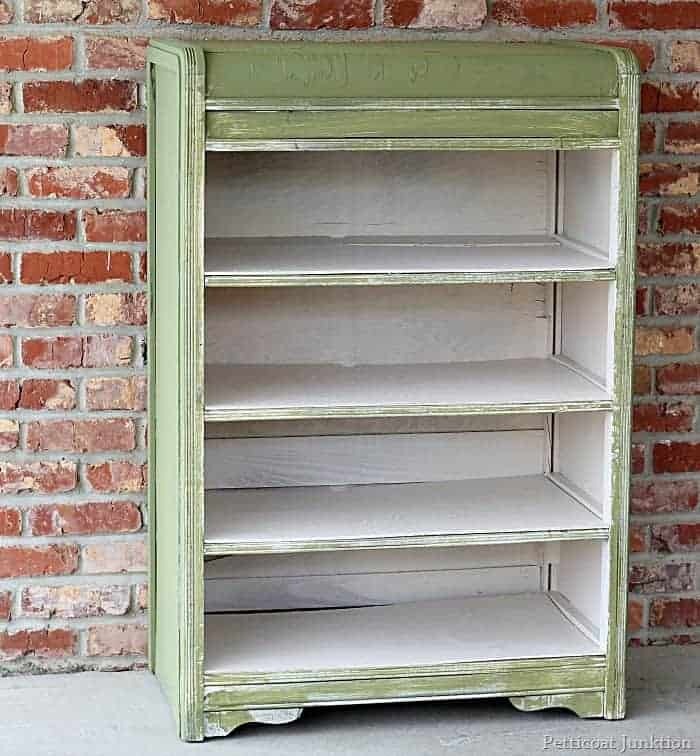 I never measure…just poured in ironstone and mixed till I got the color I wanted! 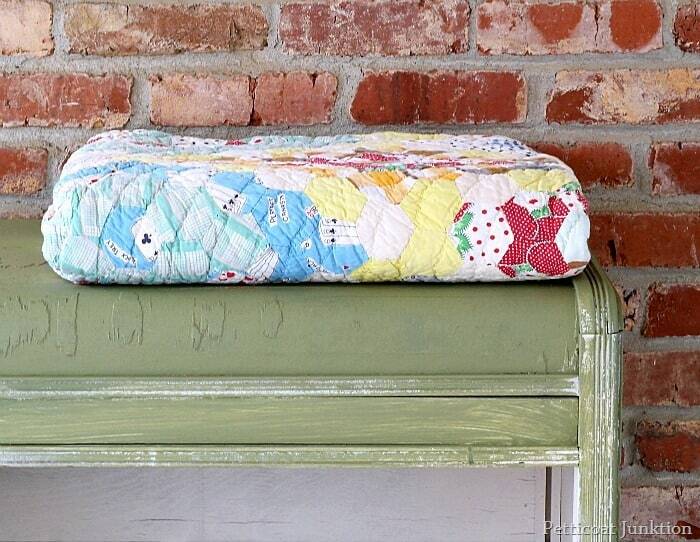 Don’t ya just love those cheap-o finds that can be turned into something so nice! Yes, the paint is definitely too shabby. It looksike a bad paint job. I love the color, tho, and the shelves are a great addition. Like that you are always using a variety of paint and colors. You also tell what they are and how you accomplished the look pictured. 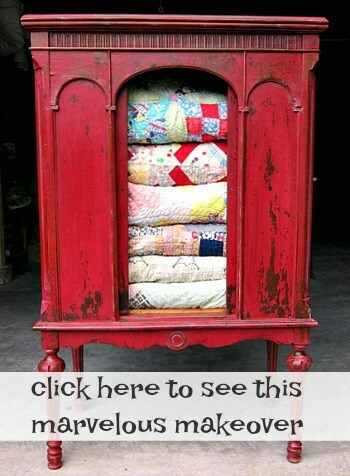 I would use it to hold vintage quilts, love it. I think this idea of storing your laptops, etc. 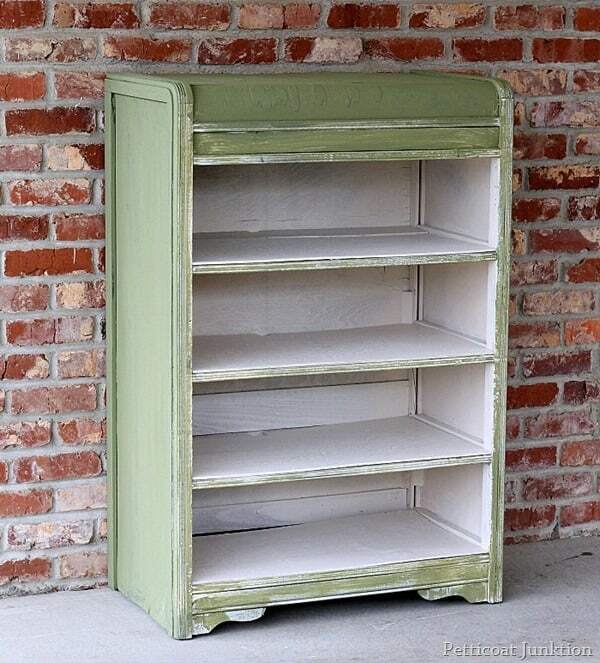 in this now wonderful open shelving is absolutely the BOMB! Since your better half is so handy have him drill the holes in the back to run your chargers through to keep all the cords hidden, but still accessible. 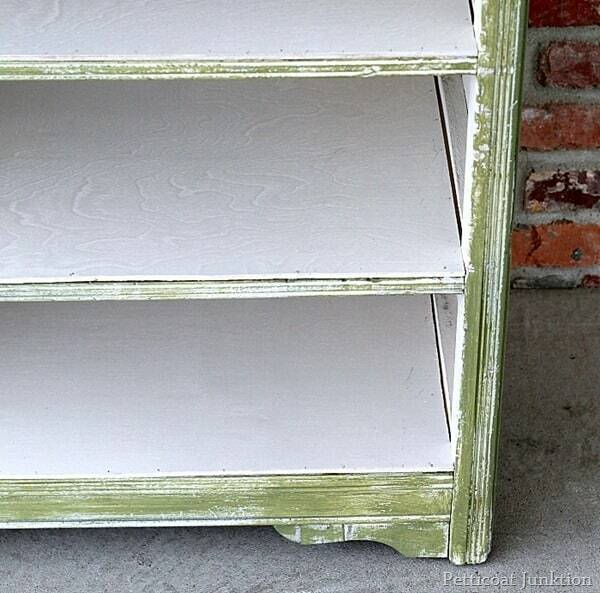 The distressing is a bit much for my taste, but I love the MMS Boxwood color paired with the white. Good girl! Great Job! 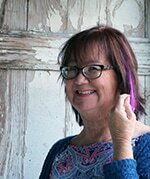 Waiting for the weather to warm up so I can try the same color in MMS paints Thanks for the inspiration! I do like it but…..for me I would sand it all down smooth and do it in semi gloss black. It has such a unique design…would look good in black…just say’in. I like it. Very cheerful. The only thing I would do is dry brush a little white paint on the left over pieces of veneer at the top. The veneer is there obviously, so why not make it OBVIOUS?